Illusions and Twisted Truths: Urbano Project's New Exhibit "ENIGMA: Reactions to Racism"
Chanel Thervil’s ENIGMA featured in the Bay State Banner! Chanel Thervil & Urbano Featured in WBUR! ENIGMA: Reactions to Racism, a mixed media exhibition by Urbano Project's spring 2019 Artist-in-Residence Chanel Thervil, will be on view February 5 - May 3, with an opening celebration Thursday, February 21, 6-8PM. Two beautiful and impactful shows, "Alone Together, Together Alone," by Nora Valdez and "Still We Rise" by Urbano Youth Artists, grace the Urbano Project gallery in Jamaica Plain through August 16. The shows work in tandem to respond to challenging political times with resilience and hope. 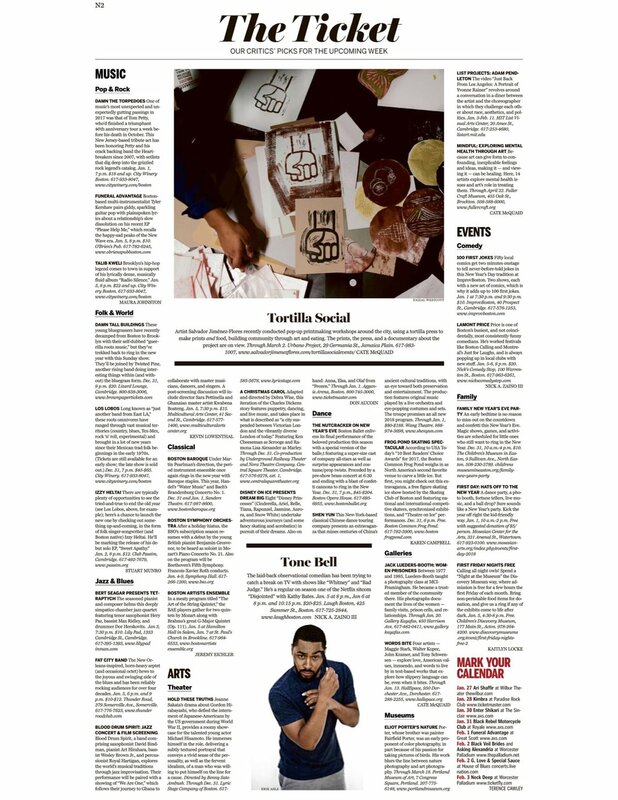 Tortilla Social featured in the Boston Globe's "The Ticket"
Artist Salvador Jiménez-Flores recently conducted pop-up printmaking workshops around the city, using a tortilla press to make prints and food, building community through art and eating. The prints, the press, and a documentary about the project are on view. Through March 2. Urbano Project, 29 Germania St., Jamaica Plain.